The Dry Icer is a new and improved professional, cost effective solution for creating spectacular Low-Lying Fog Effects. This sleek new design has a 20 pound Dry Ice capacity which is placed in a stainless steel basket. Other new features are low water shut off Indicator, 4” hose adaptor and heavy duty latches on the lid. The Low-Lying Fog output is controlled by lowering the stainless steel basket with the 3 step pivoting ratchet system. This will allow the basket to ease into the boiling water to create continuous Low-Lying Fog for approximately 5 minutes. 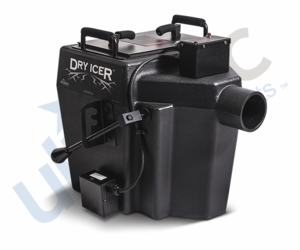 The Dry Icer has our standard One-Year Warranty on all parts and service.